Russian President Vladimir Putin has held his 13th marathon Q&A on Thursday. More than 3 million people sent in questions, touching mainly on the economy and the situation in eastern Ukraine. The Q&A session is over. It lasted about 4 hours. Asked whether Putin had taken any foreign leaders to a Russian banya [sauna], he recalled taking former German Chancellor Gerhard Schröder. A fire started in the banya when they were inside, but the German finished his beer before leaving, Putin said. Life expectancy in Russia is growing faster than the government expected, which is good, but produces extra pressure on the national pension system, Putin said. But he said Russians are not prepared to accept a hike in pension age, a measure that some officials in the economy block of the government strongly advocate. Russia would not ban foreign medicines from the market as it did with European and American food, Putin assured. He added, however, that it is essential for the country to improve its own pharmaceutical industry to ensure its security. 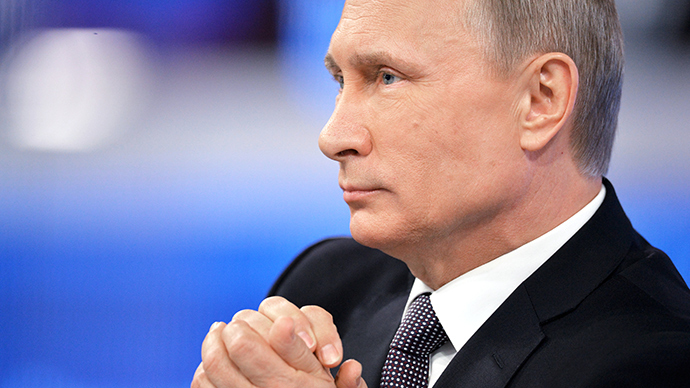 Putin said he “strongly recommends” that senior officers in Russian state-owned companies made their incomes public. He was commenting on the government’s refusal to make such publications obligatory. Putin speculated that the government’s stance was due to the presence of foreigners in boards of directors of Russian companies, who wouldn’t want to be forced to reveal their salaries.